The present and past name of the barrio was derived from the following story: Before the barrio Ipil was organized, there was a giant ipil tree growing in the village of Sarabia. When the barrio was organized, the prominent people of the village named the barrio “Ipil” which is derived from the growing giant Ipil tree. These are the following sitios in the barangay: Sarabia, Sangngagan, Kalsada Porol (away from the national highway), and Cocob. The sitios in the barrio are considered depopulated as the young generations are going to Mindanao to find new homes there. During the Spanish occupation, the people loved the barrio peacefully and contentedly, but they were ignorant and illiterate because they were not properly educated. During the World War II, the Japanese soldiers burned two houses and three lives were lost. After the war, many houses were built again. The people in general were rehabilitated little by little. During the American occupation, many houses along the road were burned to ashes because the occupation soldiers believed that the people in Ipil were all insurrectos. But, when the civil government was established, the people were happy because the school was built for their children. The barrio of Ipil was established in the year 1889. It is confirmed that there are 284 prominent residents. The families that originally inhabited from the earliest to present time were Eusebio Cagas, Metodio cacayan, Doroteo Cacayan, Juan Cacayan, Andres Cacayan, Antonio Virtudazo, Graciano Macaranas, Severo Cacayan, and Bernardino Bayhon. 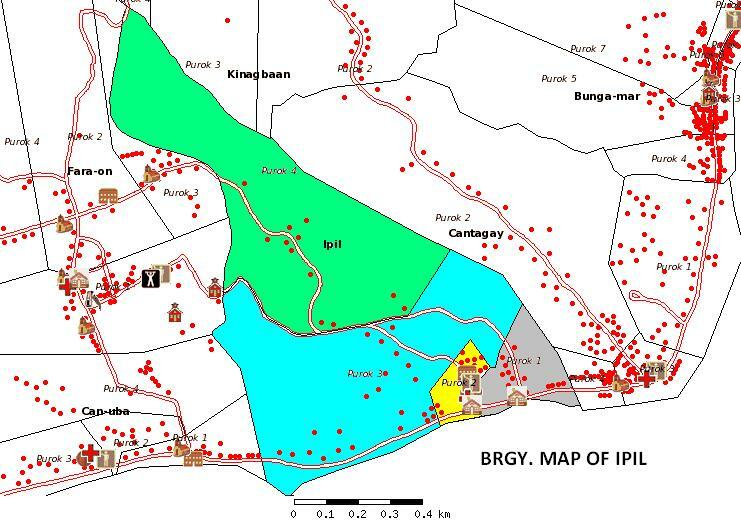 The Barangay of Ipil will become a peaceful and progressive community where people are industrious, healthy individuals and situated in good governance of the local administration and with clean and green environment. The Barangay Ipil strive to achieve the improvements and development through the strong efforts of the people in the Barangay with strong support of the different government agencies and non-government organization in all programs and activities to obtain peace order and unity in politics, economies, culture and sport. Infrastructure moral and spiritual growth of human kind.